Lunar monoliths are nothing new to anyone who has read or seen 2001: A Space Odyssey but the problem here is finding one. 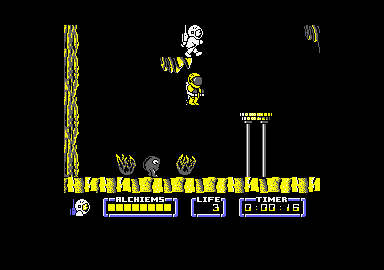 To do this a little spaceman called Charlie has to collect eight 'alchiems'from the lunar cave system and cope with all the dangers there. 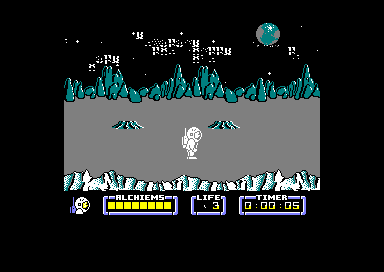 Our bubble-headed hero begins his quest on the moon's surface. There's a craggy mountain range in the background and in the foreground are craters and holes in the ground. Everything is grey (very realistic) and from time to time a mole will pop out of one of the craters, now revealed as molehills (not very realistic). If you jump at the mole, performing a graceful, weightless somersault in the process, he can be caught and put to use later on. 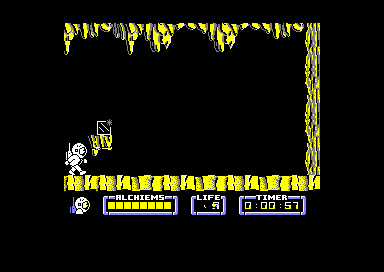 Walking over one of the holes in the ground drops you into the underground cave system where the alchiems are located. 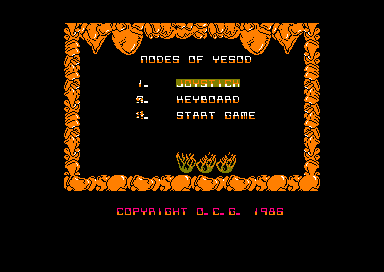 The caverns consist of relatively bare flick screens (as opposed to scrolling screens), most of which contain a number of platforms and lunar nasties. Charlie gets around by jumping between platforms, but has to be careful because very long drops can end one of his three lives. Judging some jumps can be quite difficult and you may end up infuriated at having just failed to make a leap and slipping of the edge of a platform. The other way Charlie can die is by coming into contact with the underground aliens. These come in two basic varieties: ones that float around the caves and explode on contact with you, and ones that walk around the bottom of caves and bounce you into the air on contact. These both gradually drain your energy until only a crumpled spacesuit is left as evidence of your existence. The aliens are nicely designed and animated but, like a lot of the cave system, are dull in colour. The mole that Charlie picked up comes in handy for performing two jobs. He can explode some aliens on contact, but, most important, he can dig holes in walls. You can only find out which walls through trial and error but a seemingly hopeless position or a particular arrangement of platforms may give clues. The holes the mole digs give access to other sections of the game, essential to completing it. The alchiems are shiny crystals that are tough to find, and not safe even then. 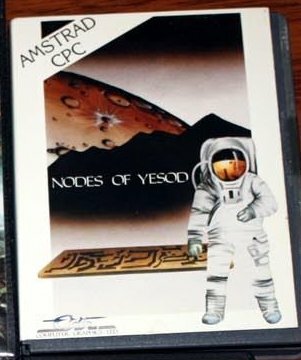 Other space suited searchers will appear on some screens and. if they touch Charlie, will explode, taking one of the alchiems with them. These and many other hazards can be dealt with using gravity sticks, which are collected along with an extra life. They remove some aliens and stop the alchiem thieves in their tracks. 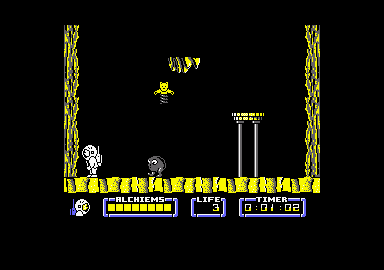 The game has some other nice touches, like a tunnel with an updraft which you can float up and down, invisible holes in the floor, and whirlwinds that act like teleports. These may help or hinder, but all make mapping the game as you go a great help. The graphics are the main disappointment about the game. They may be atmospheric and lunar-like but they're also very dull. The action itself takes a little while to get to grips with, but once you've started exploring properly there's quite a bit to see and do. A nice exploration game but not one that's going to set your mind or joystick alight. 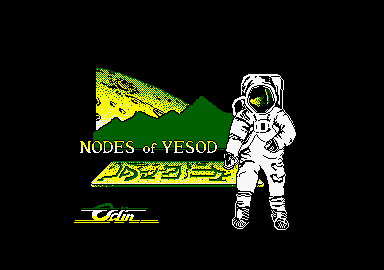 » Topic: Cheats, pokes ou solution pour "Nodes of Yesod"